Fine overall neutrality with plenty of low bass output makes this attractively finished speaker difficult to criticise, but the sound lacks dynamic grip and excitement. Floor coupling could be improved and connection arrangements are confusing. Punching 'teufel' into my computer's German translation widget produced quite a surprise, as the English translation came out as 'devil'! Quite why a loudspeaker company should associate itself with the Dark Side remains obscure, but Berlin based Teufel has been around for thirty years, so its somewhat unorthodox business model clearly works. Teufel began life in 1979, producing loudspeaker kits for the German DiY market, moving on into fully assembled systems a decade later and then in the early 1990s abandoned regular retail distribution in favour of mail order sales, apparently so it could improve price competitiveness. Assisted by the growth of the internet and the breaking down of commercial barriers across the EC, that's very much the approach that Teufel is taking here in the UK. However, a look at the website indicates that home cinema packages are definitely a priority over stereo speaker pairs, but the company's large model portfolio does also cover every known audio sector. This £988 per pair Ultima 7 (offered with a 10 per cent discount as we went to press) sits close to the top of the handful of stereo packages on offer. 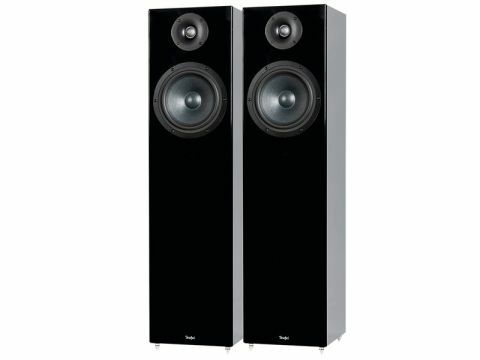 Described as a 'high-end design', this simple two-way, port-loaded floorstander is more conventional than most of its range-mates, though it does use a 200mm bass/mid driver with 150mm flared paper cone that's significantly larger than today's norm. The tweeter's 29mm fabric dome is also bigger than average. Clad entirely in a high-gloss black finish, it looks rather monolithic, but that's probably the intention. It's a pity, though, that no additional plinth is supplied to extend the stability footprint and improve the appearance. Spikes are supplied, but these were more decorative than functional (albeit invisible in use), and lacked any lock-nut provision. Since this is a two-way, finding a row of six terminal socket/binders along the bottom rear edge, just below the slot-shaped port, was puzzling. The manual explains that the inside pair are used for single wiring with the outer two pairs linked; for bi-wiring the outer pairs are separated and used, and the inner pair ignored. We questioned why you'd bother with the inside pair at all? Some of the measurements were a little surprising. While the bass extension is exceptional (+2dB at 20Hz under far-field in-room conditions), the midrange sensitivity is a very modest 87dB, despite a main driver with a good size magnet and a lightweight 150mm paper cone, as well as an impedance that falls to six ohms or below on three occasions. The load doesn't look unduly demanding in terms of amplifier current supply, but the sharp dip to around 4.5 ohms at 900Hz is unusual and a little worrying. The ports are tuned to a low 28Hz, while the pair match was very good. Measured under far-field in-room conditions, with the speakers well clear of walls, the sub- 60Hz output is decidedly strong – around 6dB above the broad midrange datum – thanks presumably to the generosity of the port output. Above 60Hz the frequency balance is smooth and very well ordered indeed, holding within an impressive +/-3dB up to 12kHz. The delightfully neutral tonal balance is the Ultima 7's stand-out feature and a worthwhile achievement by any standards. Furthermore, the measured bass excess didn't seem to be a handicap; rather it helps the speaker deliver a fine impression of weight and scale. However, the weakness here is the lack of dynamic expression, a factor that is difficult to explain and rather undermines the speaker's impressive behaviour in other respects.